In the past I've used PCI Geomatica to do something similar using the softwares classification functionality. Are there some tools/tricks in ArcGIS that will partially automate the process. I remember reading somewhere about rasterizing an orthophoto and assigning values to rooftops, which polygons where then created from those values. I can see there being issues in trying to automate the task as there will surely be some inaccuraces do to color, obstructions, image quality, etc. There are many options for you in ArcGIS, however I would stay open to open-source solutions too. You can purchase an extension for ArcGIS called Feature Analyst, which uses a feature extraction algorithm. Otherwise, try Iso Cluster Unsupervised Classification (Spatial Analyst) on 4-band DOQ's (Earth Explorer). Once you find the right recipe for classifying buildings in your DOQ, try running the product through a raster filter prior to vectorizing the raster with Raster Domain or Raster to Polygon. For an open-source solution, Orfeo Toolbox has powerful image segmentation, clustering and feature extraction capabilities. I don't know there is any way to automate such process by using ArcGIS. But I strongly recommend you to check out one software which name is eCognition developed by Trimble. eCognition is based one the idea of object oriented classification; it builds up a picture iteratively, recognizing groups of pixels as objects. It uses the color, shape, texture and size of objects as well as their context and relationships to draw the same conclusions and inferences that an experienced analyst would draw. I had tried this software before and I think it extracted roofs and other kind of features (parking lot, street, rivers) very well. If you're not averse to buying an extension product, you could take a look at Image Analysis for ArcGIS, which may help with this. 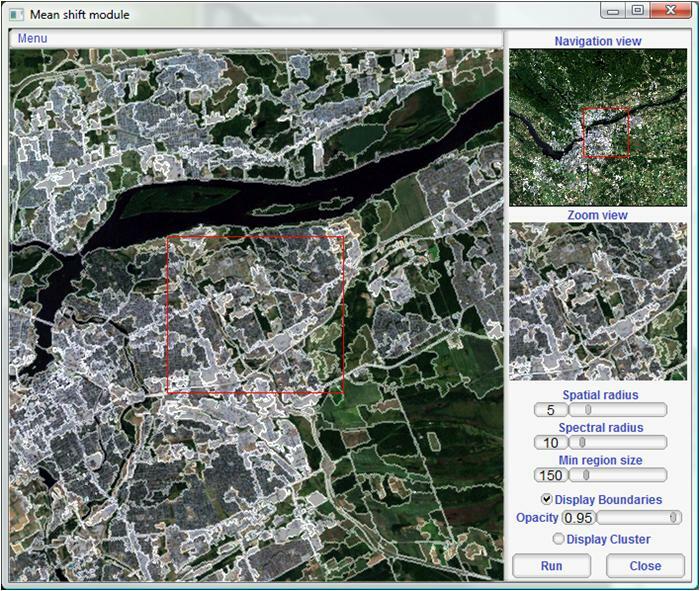 "...it enables you to extract up-to-date information from imagery directly into a geodatabase"
Also check out this GEM User guide: Geospatial tools for building footprint and homogeneous zone extraction from imagery. It provides an in-depth step by step look at how to extract building footprints using both ArcGIS DEsktop and QGIS with plugins Built-­up RECognition tool (BREC) and GRASS. Not the answer you're looking for? Browse other questions tagged arcgis-10.0 digitizing footprint orthophoto or ask your own question. Is there a simple way to clip multiple layers and orthophotos? Digitizing in ArcGIS for Desktop?